SAAS Software as a Service AG enables retailers to sell online and leverage their stores for delivery and pick-up programs with highly efficient in-store pick-pack-ship capabilities. This enables retailers to meet and exceed the needs of their customers for omnichannel shopping and delivery. SAAS delivers this through the Grocery Commerce Cloud, a cloud-native Headless Commerce microservices API platform that enables grocers to transform their supermarket business and to thrive in the highly competitive grocery marketplace. Grocers future proof their business with an agile, headless, cloud-native commerce software to drive innovation and cost efficiency, while leveraging existing technology and physical store locations. Grocery Commerce Cloud is a cloud-native headless microservices commerce software tailored to the specific needs of grocers’ online and omnichannel businesses. Unlike other leading commerce software platforms, the Grocery Commerce Cloud supports the unique needs specific to grocers. This includes support for weight-based pricing, local delivery, in-store highly efficient wave picking, postal-code related ordering, route-optimized delivery as well as grocery specific payments and customer loyalty processes. Beyond core commerce processes, Grocery Commerce Cloud’s proprietary wave-picking algorithm boosts store associated in-store picking performance, lowering cost and protecting the margins of grocers. And with the Grocery Commerce Cloud they keep control over their brand, their product portfolio and their pricing strategy. Grocery Commerce Cloud is a fully headless microservices software, enabling a wide range of customer touch-points. This includes online, responsive web app, native mobile app, voice or text-based interfaces, and IoT - from one cloud-based multi-tenant solution. 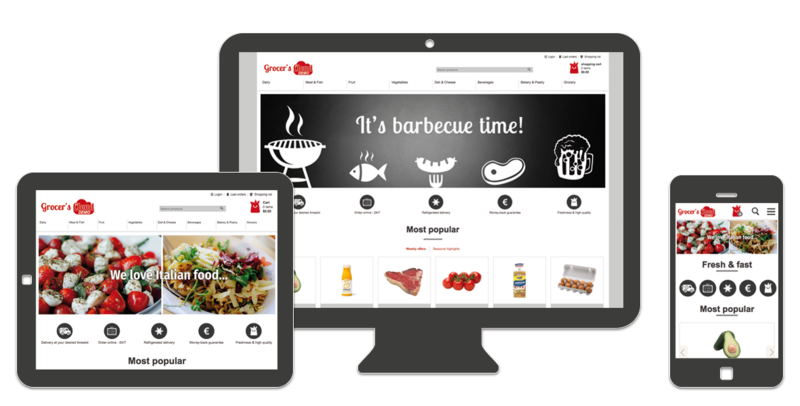 Grocery Commerce Cloud provides a pre-configured responsive web app for grocers to launch online and mobile stores quickly. The Grocer Success Program provides clients and partners with both technical and in-store process support to ensure clients gain maximum efficiency with the platform - especially in-store picking, packing and shipping processes. Grocery Commerce Cloud is a subscription-based solution with revenue-based pricing model, with very little up-front investment required. If you are a regional or national or multi-national grocer, contact us today to receive a complete overview of the solution. Watch a YouTube video and see how our customer Lieferladen.de sells fresh groceries from local producers in an efficient way thanks to the pick-pack-ship capabilities of Grocery Commerce Cloud. Grocery Commerce Cloud brings back control and gives you the choice. Get started quickly and with very little investment with our pre-configured, responsive web app. Or enjoy full freedom and build a customized user experience with our Headless Commerce APIs. With our more than 8 years of experience in the online grocery business, you can rely on a strong partner. State-of-the-art IT architecture with microservices running in the Cloud. Continuous development and deployment! Secure, scalable, performant. Forget about IT infrastructure, get back into the driver seat and focus on customers and features! Use our pre-configured online shop or build your own user interfaces with our SAAS Headless Commerce API’s. Easy and fast grocery-shopping with special functions for ordering by weight, deposit handling or service counters. Supports the whole process for in-store picking, packing and shipping. Boost your picking performance and margin! Control delivery based on ZIP codes. Let customers choose delivery times and price delivery fees according to time windows. Pre-configured online shop web app runs on computers, tablets and smartphones. No additional native app needed! Margins in food trade are low. Use efficient payment methods already integrated – suitable especially for groceries. SEO, dynamic management of products and marketing web content, newsletter list, loyalty points, voucher generator. Don’t give your core competences away. Run your online business yourself and keep control over your brand, products & pricing. Combine your brand with our software and our know-how in the online grocery business – we grow with your success! We are there to make you successful and consult you throughout the partnership with our Customer Success Program! SAAS software is true cloud-native multi-tenancy headless microservices commerce. This allows agile development and continuous deployment. The Grocery Commerce Cloud is based on the most up-to-date technologies. Business logic is part of JAVA based microservices. As a storefront there is either a pre-configured single page web app based on Angular. This keeps cost at a minimum and guarantees rocket fast go-to-market as grocery specific features are already built in. Or retailers can operate the Grocery Commerce Cloud microservices as Headless Commerce API’s. This allows the development of basically any kind of user interface. Even more individual web apps, native mobile apps, voice commerce solutions or anything else the IT future might bring. The microservices concept in the Cloud releases IT from infrastructure concerns and brings agility back to sales and marketing. Issues around performance, scaling or peaks become history. It doesn’t matter if you run a single grocery store or a big food supermarket chain - the Grocery Commerce Cloud architecture is ready to handle it. Forget about system operations issues and focus on your business and your customers! The Grocery Commerce Cloud is based on many years of online experience and tailored to the needs of the grocery business. Both Online-Shop and Back-Office are rich of industry-specific features. Our Grocery Commerce Cloud e-commerce software has been developed in cooperation with grocery stores. The result is a cloud-based solution that is tailored to the needs of the online grocery business. Both online pure players like Lieferladen.de and stationary supermarket chains like NATURGUT benefit from our feature-rich and easy-to-use software. No matter if you are running a single grocery store, a food supermarket chain or if you are responsible for the IT department of a food retailer - have a look at our software and our references. You will be excited! GoKo stands for ‚Go Kosher‘. They pride themselves of stocking the largest selection of Kosher food and household supplies. There are two local Kosher supermarkets in the east of London, UK. 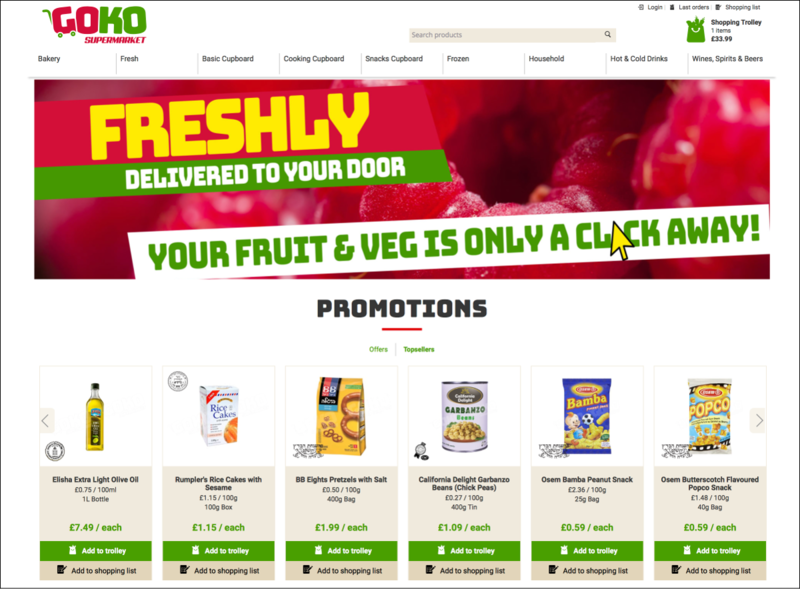 Since June 2018, GoKo offer their online delivery service throughout the UK mainland. Groceries are both picked in-store and sourced just-in-time from local food suppliers. 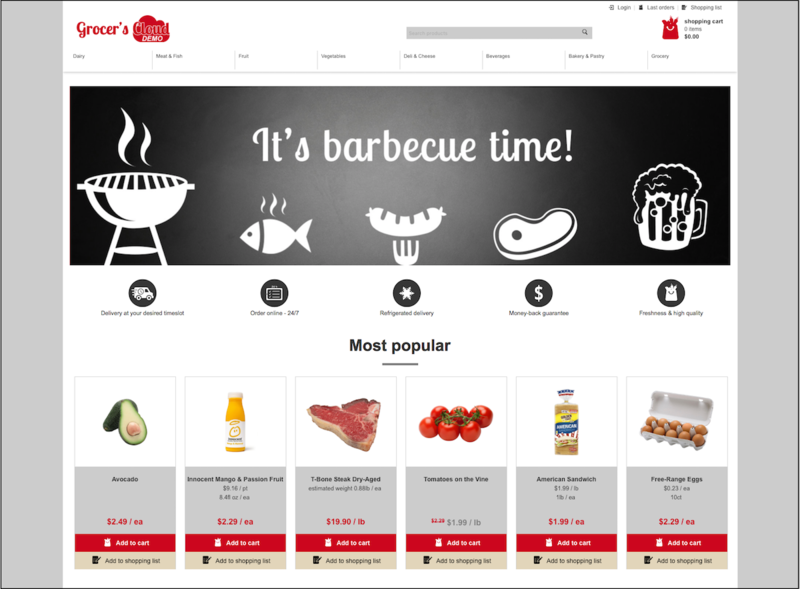 This case study is about a grocery store that opens up an online shop called Grocer’s Cloud using our SAAS Food Commerce Cloud e-commerce software. The grocery store described in this article is fictive, but this story can (and probably will?) become reality for many real grocery stores all over the world. GoKo stands for ‚Go Kosher‘ and is a local Kosher supermarket with 2 branches in the east of London, UK. GoKo is live since June 2018 and combines both in-store picking and just-in-time sourcing from local food suppliers. 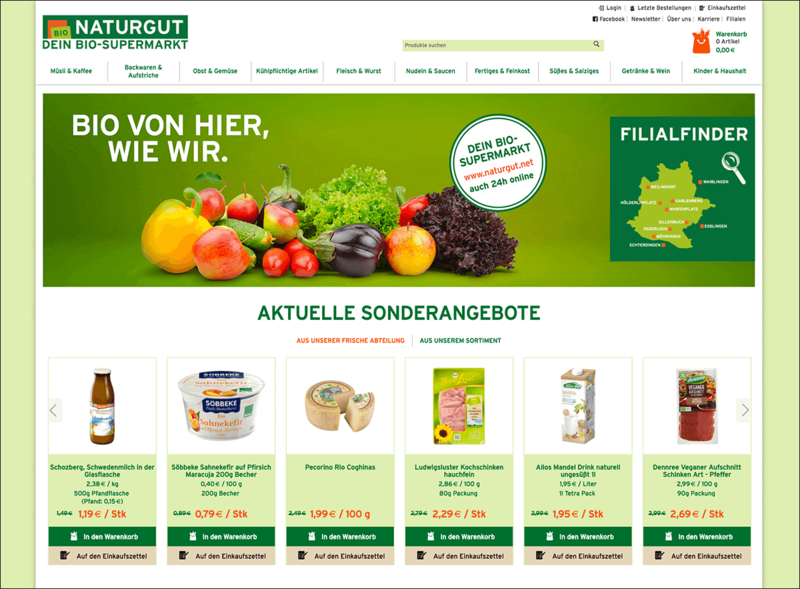 Lieferladen.de Stuttgart is the local online supermarket for fresh food in the region of Stuttgart, Germany. Online since 2010 and the flagship of the Lieferladen.de partner system. Naturgut is a regional organic supermarket with 10 branches in Stuttgart, Germany and the region. Online since 2016, Naturgut relies on the technical know-how and expertise of SAAS AG in the online food business. Grocer’s Cloud is our international reference store in English language with US measurement units and US dollar as currency. 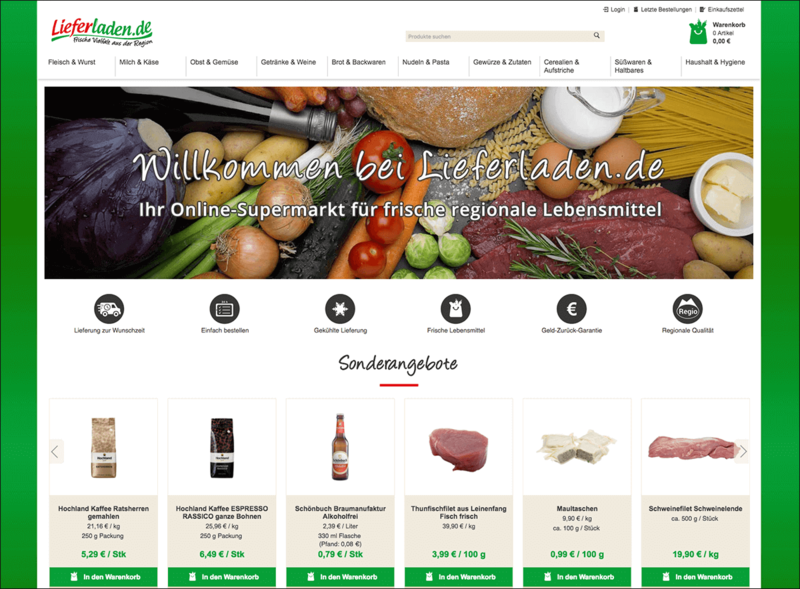 Lieferladen.de Ulm is the local online supermarket for fresh local food in the region of Ulm, Germany. Online since 2014 as a Lieferladen.de partner shop with own suppliers and own assortment. As SAAS Software as a Service AG we are proud to offer our cloud-based solution for the food retailing business in a real Software-as-a-Service (SaaS) manner. What that means? You pay based on your actual usage. And as it is extremely difficult to predict (and most often even unfair?) how to generate bills based on parameters like API calls, number of cart transactions, orders and so on, we simply don’t do this. Instead we have a very simple pricing model. We charge based on the online turnover generated with our software solution Grocery Commerce Cloud. That means you start with a small bill and practically no investment risk. Then you grow your business with a smaller commission percentage on the bill. Finally there are almost no limits to further growth and you run your business at a very competitive commission rate. Fair enough? Contact us, we are happy to further explain and to START, GROW and RUN also your food retailing business! Initial one-time setup cost for deploying the Grocery Commerce Cloud depend on the degree of customization and the integration of third-party systems. Our e-commerce software Grocery Commerce Cloud is based on SAP Cloud Platform (SCP) and runs in the Swisscom Application Cloud. Our modern microservice architecture with cloud-native Headless Commerce API's stands for performance, scalability and reliability. Interested? Please don’t hesitate to get in touch with us. We are happy to give you more details on our software solution to sell groceries online.